Join and learn the basic technic of kayak such as balance, propulsion and turn. During the course we will teach the theoretical basis and the practical skills which we will practice in calm water without tide or waves. Designed for people who already master the basic skills and already is kayaking a few times a year. Join to gain both new skills by focusing on maneuvers and precision as well as improved balance and reflexes all of which will aloud you to take your paddling to the next level. Requires minimum of 3 and maximum of 6 people to ensure the quality. Focused course in teaching you the eskimo roll. 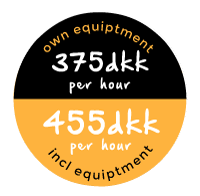 375dkr per hour if you bring your own equipment and 455dkr per hour with all equipment including kayak. Experience Copenhagen from a kayak as the locals do it. We paddle safely and easily around the canals from which many of the famous sights of Copenhagen can be seen. The life along the waters of Copenhagen is growing each summer as the Danes hang out by the water to enjoy the long bright summer evenings. Requires a minimum of 4 people and reservations ahead.